1. Why “Low” Oscar Ratings Shouldn’t Matter. 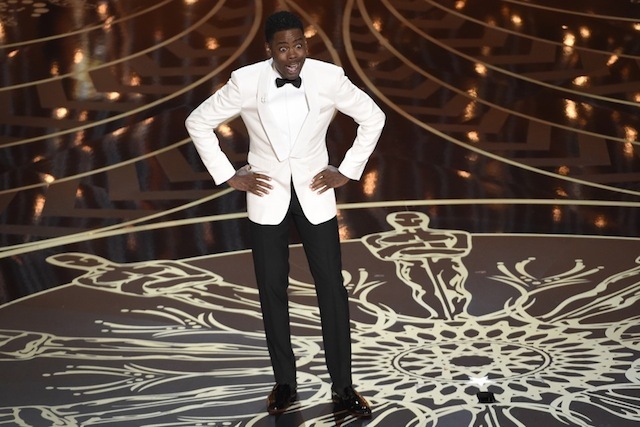 Though the 2016 Oscars came under heavy criticism for its lack of diversity, the actual ceremony mostly received positive reviews as host Chris Rock’s performance made good on the promise of attacking and highlighting Hollywood’s racist tendencies. However, the Academy Awards received the third-lowest ratings in history. The Atlantic’s David Sims argues why it’s not Chris Rock’s fault that the ratings are down and why ABC shouldn’t exercise creative control over the ceremony. In 2004, the Oscars handed 11 trophies, including Best Picture, to the most commercially successful film of the previous year, “The Lord of the Rings: The Return of the King.” No surprise then, that the ceremony’s TV ratings jumped 30 percent from the previous year, with 43.6 million people tuning in. Viewership has fluctuated since then, but in 2014, it was roughly the same as the year “The Lord of the Rings” won big. The Best Picture winner in 2014? “Twelve Years a Slave,” a film that domestically grossed about 85 percent less than “The Return of the King.” In other words, viewers tune into the Oscars for many reasons, and the relative popularity of the winning films is just one of them. But that hasn’t stopped pundits from partaking in the typical doomsday talk that accompanies a down year. Sunday’s Oscar telecast attracted 34.3 million viewers, an eight percent decline from last year, though not the lowest on record (2003 and 2008 were worse). Writing in “The New York Times,” Brooks Barnes and Michael Cieply attributed this decline to a loss in black viewership, the host Chris Rock’s apparent lack of fame, the lower profile of the nominated films, and the hypothesis that “soapbox moments to espouse causes — and there were plenty on Sunday — have historically turned off viewers.” Heaven forbid. The “cause” this time was the Academy’s need to diversify its membership, in hopes of avoiding another year with an all-white slate of acting nominees. But bluntly confronting that onstage was necessary, and blaming Rock’s performance for a slight ratings dip is short-sighted. It’s clear where the drumbeat of criticism for Sunday’s ceremony is coming from inside the industry. A story in “Variety” suggests that ABC, the network that airs the ceremony, is pushing for more creative control as it renegotiates its TV contract with the Academy. Right now, AMPAS gets to pick the producer and the host, and set the overall tone for the ceremony. According to “Variety,” the Disney co-chairman Ben Sherwood (who recently engineered the resignation of ABC’s well-regarded head of programming Paul Lee) is using declining ratings as leverage to seize control. The article’s anonymous sources called Sunday’s ceremony “lackluster,” pointed to the Golden Globes as “a pretty slick show” that the Oscars could look to emulate, and decried Rock for “going back to the same theme” of Hollywood racism throughout the night. The idea that anyone who watched 2016’s Golden Globes ceremony and saw something worth imitating is laughable. It was an absurdly messy affair that featured a comedically tone-deaf hosting job by Ricky Gervais, run-on speeches from drunken winners who seemed as confused as the viewing audience, and Mel Gibson as a presenter. As for its ratings? It drew 18.5 million viewers — down from the previous year. By comparison, while this year’s Oscars certainly had their own tone-deaf moments (the gag with Asian children dressed up as accountants being one example), they also gave Rock free rein to criticize Hollywood’s systemic racism in his opening monologue, while the Academy President Cheryl Boone Isaacs made a sterling on-air appeal to members and the viewing audience to help forge a path to a more inclusive future. Yet according to Barnes and Cieply, “Nielsen data reflecting quarter-hour segments of viewership indicates that Sunday’s show appeared to lose viewers as glamour (and movies) increasingly took a back seat to activism,” noting that “Sunday’s ratings fluctuated and then fell more steadily in the show’s last hour, as issues of sexual assault, environmentalism, and gay rights were put forward by presenters and award recipients.” This seems like a false equivalence: Lady Gaga’s performance and Leonardo DiCaprio’s speech were among the most-discussed moments of the night, and the idea that the ceremony’s ratings declined as it ran well into the night (wrapping at around midnight EST) and viewers went to bed seems much more logical. 2. Disney’s Latest Film Takes on Racial Biases. If you’ve seen all the recent advertisements for Disney’s “Zootopia,” you’ll be forgiven for thinking it’s just about talking animals. But the movie actually tackles more pertinent and timely issues than just presenting cute images to children. Buzzfeed’s Alison Willmore reviews “Zootopia” and discusses how it takes on racial biases. “Zootopia” takes place in a universe populated entirely by highly evolved animals who wear clothes (except for the naturists among them), have jobs, and live together in civilized, not quite perfect harmony. The city of the title is an ingeniously realized metropolis of artificial microclimates (desert, tundra, rainforest) and different-sized streets and services that manages to be visually delightful while leaving unanswered trickier questions, like just what the carnivores eat now that everyone gets along. It’s a world in which race does not exist. But species certainly do, and they provide a fuzzier, cuddlier way for “Zootopia” to get at some thorny issues of prejudice and profiling. On a broad, kid-friendly scale, the movie does this through the developing of Judy and Nick’s cross-species friendship and how they overcome the assumptions placed on them and that they hold for each other — a story about acceptance and the damage caused by prejudgments. But “Zootopia” is filled with more specific references that signal its aims unmissably to older viewers, from the moment Judy, who becomes the first rabbit to graduate from the police academy courtesy of a “mammal inclusion initiative,” firmly informs someone that “a bunny can call another bunny ‘cute,'” but that it’s really not OK for other animals to do it. “Zootopia,” which was directed by Byron Howard and Rich Moore, with Jared Bush co-directing, isn’t the best animated feature Disney’s made. Its main narrative — a city-hopping (LOL) rabbit–fox mystery involving a dozen or so disappearances, organized crime, and a possible conspiracy — feels too heavy for its bright and bouncy tone, like it’s a darker structure that’s been, Roger Rabbit style, shoved into Toontown. Judy and Nick are a deftly created mismatched duo who, poignantly, took opposing lessons from similar, formative childhood experiences with bullying. But the other characters are hit or miss — the sloths working at the DMV allow for a sequence that’s a pean to comic timing, but a mob boss voiced by Maurice LaMarche as a “Godfather” reference feels cheap, an easy, “Shark Tale”-level joke wedged into a movie that’s supposed to be better than that. But that’s the thing about “Zootopia.” It’s from the venerable Walt Disney Animation Studios, a brand that’s made a decades-long fetish out of fairy tale and talking animal timelessness, but the issues it wants to tackle stop not all that far short of conversations central to Black Lives Matter. It’s torn between classic animated film instincts and more urgent ones. No one gets killed by a cop in “Zootopia,” but the city becomes gripped with police-incited paranoia about the predator minority, overcome with suspicion that they really are inherently more dangerous, a population that can’t be trusted and that everyone else needs to be protected from. There’s a scene in which one character instinctively flinches from another, and, for a small moment, it’s a shocking betrayal. Zootopia is a place where anyone can be anything, as Judy idealistically trumpets, except when you’re reminded that everyone’s already assigned you qualities based on what species you were born as. 3. “Deadpool’s” Thoughtful Approach to Teenage Girls. Remember Marvel’s R-rated smash hit “Deadpool”? The Ryan Reynolds vehicle that features a profane, sexually active superhero that aggressively winks at the audience? It can be easy to forget in the midst of Oscar season, but there are plenty of people still catching up with the movie. The Washington Post’s Alyssa Rosenberg tackles “Deadpool” and how it actually takes a thoughtful approach to teenage girls. Blake Snyder, author of “Save the Cat,” an influential book on screenwriting, argues that an important element of any successful movie is the moment from which his tome draws its title: “It’s the scene where we meet the hero and the hero does something — like saving a cat — that defines who he is and makes us, the audience, like him.” In “Deadpool,” the Save the Cat moment comes when Wade Wilson (Ryan Reynolds) confronts a nerdy pizza delivery guy (Style Dayne) who has been stalking a teenage girl named Meghan (Taylor Hickson) and warns him to stay away from her. Meghan isn’t necessarily a damsel in distress; after Wade’s intervention, we see her chatting around a bonfire with some friends. But she’s grateful for his help. It’s not weakness to acknowledge that sometimes you need help. And Meghan’s not the only teenage girl in the movie. After Wade becomes Deadpool through an experimental treatment paired with a nasty side of torture, the X-Men, particularly Colossus (Stefan Kapicic), keep trying to recruit him to the team. As a result, Colossus keeps dragging along his mentee, the young mutant Negasonic Teenage Warhead (Brianna Hildebrand). She has facial piercings, close-buzzed dark hair and a laconic attitude, and while Deadpool knows precisely how to tweak Colossus, he keeps trying and failing to get a reaction out of Negasonic Teenage Warhead, teasing her about everything from her Goth look to the way teenage girls talk. Deadpool and “Deadpool” take the revenge mission at the heart of the movie very seriously. But Negasonic Teenage Warhead’s relative indifference to his violent antics, and to Colossus’s dismay at those antics, functions as a sort of internal critique of all this frenzied running and jumping and moral debate. It’s not so much that she devalues Deadpool’s yearning for a love he thinks is lost to him, or his quest for some richly deserved vengeance. But Negasonic Teenage Warhead’s presence in “Deadpool” punctures the self-importance that so many superhero movies have adopted in recent years. I’d love to watch Tony Stark (Robert Downey Jr.) and Captain America (Chris Evans) try to impress her. 4. “Ain’t Got No, I Got Life”: #OscarsSoWhite and the Problem of Women Musicians on Film. At the Oscars this year, Asif Kapadia’s “Amy” took home the Best Documentary Feature award over Joshua Oppenheimer’s trenchant “The Look of Silence” and Liz Garbus’s “What Happened, Miss Simone? about the late Nina Simone. Though “Amy” garnered positive reviews at the time of its release, many critics believed that these latter two films were much more worthy of the Academy’s attention. At the LA Review of Books, Daphne Brooks explores Garbus’s documentary, #OscarsSoWhite, and the problem of women musicians on film. It goes without saying, then, that what none of these works do what Garbus’s film does so eloquently, and with a kind of beauty and reverence for the music, is to use Simone’s live performances as critical narration and as thematic arcs in the film’s trajectory. Garbus is unafraid of allowing us to live in these sometimes intense, extended scenes of Simone’s performances, where her notoriously volatile (at times passionate, playful, and affectionate, and other times combative) relationship with her audience and her tremendous commitment to technical and artistic excellence are on display. These performances operate as a kind of metanarrative voice in the story of Nina Simone’s ascent as a musician and the battles that she waged both publicly and privately to maintain control of her artistic autonomy, her political integrity, and her fundamental personhood as an African-American woman on the frontlines of the Civil Rights and Black Power movements. Take, for instance, the opening, which lingers on Simone taking the stage at the 1976 Montreux jazz festival concert and declaring both her return to performing after a long hiatus as well as her imminent departure from the jazz festival circuit (“after which I shall graduate to a higher class, I hope, and I hope you will come with me […]”). Here we are invited to listen closely to a musician documenting the aesthetic labors of her career. After a long, deep bow and an extended pause looking out into the darkness of the audience, Simone takes her seat at the piano and refers to her first recording from 1958, announcing that she and her ensemble will “start from the beginning, which was about a little girl. Her name was Blue […]” Simone in performance thus initiates the narrative journey on which we will now embark. Or consider the tumultuous gravitas of her reading of “For All We Know,” a clip taken from early in her career, which serves as a complement to her devoted guitarist Al Schackman’s reflections on the first time he played with Nina. “It was like we had a telepathic relationship,” Schackman muses, while Simone likewise offers her own observations about Schackman’s talents and the necessary skills needed to keep up with her: “He has perfect pitch which means that no matter what key I’m in he’s able to adapt […] because I do that all the time. I change the key that I’m in […]” Simone’s voiceovers enable her to extemporize on her craft with precision and clarity. “What I was interested in,” she observes, “was conveying an emotional message, which means using everything you’ve got in you […] [S]ometimes I sound like gravel, and sometimes I sound like coffee and cream […]” This and other potent performances of songs such as “Backlash Blues,” “To Be Young, Gifted and Black” and a riveting, late-in-life rendition of “My Baby Just Cares for Me” to close the film amount to something of the sonic metalanguage of the film, the other frequency on which we hear and see an artist choosing to “reflect the [political as well as personal] times.” Garbus’s careful placement of the footage in conversation with the commentary of others allows for Simone, the musician, to constantly build and rebuild what Josh Kun and Alex Vazquez might each call a “sonic place of dwelling” for herself as the voices of her loving, conflicted, and candid daughter Lisa, family friends such as Ambassador Attallah Shabazz and Ilyasah Shabazz (the daughters of Malcolm X), European caregivers (whose role in returning her to the stage late in her career remains a source of controversy), and her morally compromised ex, Stroud, each contemplate her mental health, the price of fame, and the toll that liberation activism took on her spirit. 5. A View From A Booth. The Metrograph Theater, the shiny, new repertory theater in New York, begins showing films this Friday, and already has an impressive roster of films this month, including Jean Eustache’s “The Mother and the Whore,” Todd Haynes’ “Carol” in 35mm, and Godard’s “Vivre La Vie.” But along with their masterful programming, their website offers plenty of great film writing, like interviews with filmmakers and articles about cinephilia itself. On the site, Genevieve Yue discusses life as a projectionist and how she fell in love with film from the booth. My first encounters with “Pickpocket,” “Breaking the Waves,” “Ordet,” “The Passion of Joan of Arc,” and “Jeanne Dielman, 23, quai du Commerce, 1080 Bruxelles” happened from behind that small glass window. These are hazy impressions. It’s hard to pay attention to a film while projecting it, because much of the time you’re looking directly at the film, threading or rewinding it, adjusting sound levels, or trying not to blink as you wait for the cigarette burn to appear so you can make the switch to the reel on the other projector. Focusing the film can take all your attention, especially when dealing with a warped print or an image that rarely stays put, as in the case of Stan Brakhage’s hand-painted films. Whenever I attend a projection of a print, I still cringe when someone in the audience shouts “focus,” because they don’t understand the way prints harden and buckle when they age, or how the constant toggling of focus means the projectionist is hard at work. But usually the projectionist can’t hear that person anyway. A year after I started, the Bell and Howell projectors we used were replaced by large industrial projectors sourced from the U.S. Navy by a man named James Bond. Bond is a legend among projection system designers, though I didn’t know it at the time. But for years afterward, I would encounter his meticulous handiwork when I attended screenings at the REDCAT in Los Angeles, the Walker Art Center in Minneapolis, the Gene Siskel Film Center, and others. The 16mm projectors he brought to the James M. Stewart Theater were as big as the 35mm projectors, and just as powerful. Each had its own vent, and unlike the weak lights of the previous classroom model projectors, the Xenon bulbs in the new projectors could burn through film. This both terrified and enthralled me. Fire seemed the surest way to destroy a print (granted, this was not nitrate, so there was no danger of burning down the theater), but I also secretly longed to see an image inflamed onscreen. Of all the films I projected, this only happened once. On the night I showed “Mr. Smith Goes to Washington,” a section of the film caught in the gate, sputtered to a stop, and began to bubble and melt. Though the film was black and white, the image we saw was a rich amber rippling around the white hole growing in the middle of the screen. The images stood frozen, but the film kept curdling, as if all the motion had migrated to the film itself. In the end, the damage wasn’t all that bad: just a few ruined frames, no more than a fraction of a second. I still have that filmstrip with Jimmy Stewart and Jean Arthur standing beside each other, a golden-edged void opened between them. For 35mm films, the union projectionists were brought in. They didn’t have much use for me, though when Francesco Rosi came to show his 1998 film “The Truce,” based on Primo Levi’s journey home following the liberation of Auschwitz, I was given the task of pinning a microphone to the director’s lapel. The union projectionists also worked the night Nathaniel Dorsky delivered the first version of what was to become “Devotional Cinema,” and when Robert Beavers showed a selection of his very pristine and precisely edited experimental films. I’d heard how exacting these filmmakers could be about the projection of their films, and on those nights I was happier to be a student in the audience and to forget entirely about what was happening in the booth. It is impossible to show a film without ruining it a little. Even under the best conditions, the projection of a film will result in the accumulation of tiny scratches and dust, and sometimes a perfectly calibrated machine will chew up a jumpy print. Films aren’t just flickering images we see on a screen but objects that can and will get worn down. When left untouched in a vault, films are still vulnerable to heat, moisture, and the fading that comes with age. (Archivists have yet to agree on how best to preserve film, acknowledging the limitations of acetate stocks, as well as digital formats that are themselves prone to crashes and sudden disappearance. Where it concerns the longevity of film, there is no secure medium.) The act of watching a film then is indirectly tied to its slow but sure decomposition. Projectionists are well aware of this, and they seek to prolong the inevitable. Part of reckoning with the medium is knowing that it won’t last. People who act like the fact that not-great films win Oscars means that Hollywood is only making bad films don’t watch enough movies.